I'll start with this: I do not recommend A Conspiracy of Stars by Olivia A. Coles. Enter the vivid and cinematic world of Faloiv in the first book of this dazzling YA sci-fi/fantasy series, perfect for fans of Carve the Mark, Red Rising, and These Broken Stars. The highlighted words in the third paragraph in that description tell you why people brought A Conspiracy of Stars to my attention. It has Indigenous people of another planet. That planet? Faloiv, where the Indigenous people are the Faloii. Octavia is 16 years old. As the book opens, she's with her father in a chariot, driving outside their compound (the "Mammalian Compound some call "the Paw"). They're from the "Origin Planet" and got to Faloiv aboard a ship they called the Vagantur. When it left that planet, there were 500 people on it, but as the story unfolds, we learn that some of them went missing. That's an important hint of what is to come. Five pages in, Octavia pulls up to the "wigwam" that serves as a gatehouse. The word 'wam appears 49 times. Octavia and the people from the Origin Planet refer to their homes as 'wams. Why did Coles choose wigwam/'wam? If you're a regular reader of AICL and, in particular, the Birchbark House series by Louise Erdrich, you know that a wigwam is an Ojibwe house made out of birchbark. Is Octavia (and the people from the Origin Planet) Ojibwe? I doubt it. Octavia is using an Ojibwe word, though. Why, I wonder? What's the backstory there (backstory is the reasoning behind an author's choices)? "This dead language is just one, the one they decided should survive. Think about how many other languages we probably left behind!" Octavia is unhappy with what she hears herself saying (that they should focus on the future, not the past), and Alma tells her that the future might make more sense if they knew more about the past. Of course, they're talking about earth and -- given the wigwam -- I'm going to guess they're talking about European colonization of the places currently known as the Americas. 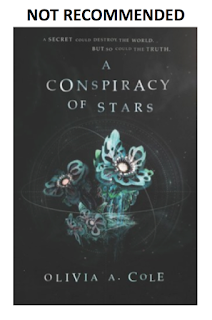 A Conspiracy of Stars is meant to address colonialism. Does it work? I suppose it does, for an audience that hasn't thought carefully--if at all--about colonialism. I get the appeal of these books, but, all this "learning" through these books kind of demands that Native kids either not read the book, or, grin and bear it as their non-Native peers learn about the evils of colonialism. Over on Goodreads, there's several reviews that note its similarity to Avatar (you know--the movie with the blue people who shoot arrows). That movie didn't work for me, and A Conspiracy of Stars doesn't either. Horrible things are done to the Faloii. As the story progresses, we're going to learn that the buzzing Octavia 'hears' is an ability to communicate, telepathically, with other beings. Her brain, it turns out, is different. She's been given a gift from the Faloii and from her grandmother. Through all but the last few pages of the book, we are meant to think that Octavia's grandparents are dead, but they aren't. They are among the 100 that split apart from the main group. They're alive, and living with the Faloii in a Faloii city. "Come. Your grandparents are waiting." That, for me, elicited a deep sigh of disappointment. Octavia's grandparents weren't dead after all. They had "gone Faloii" -- or to use more familiar words, they've gone Indian. Most readers on Goodreads are taken with those last words and cannot wait for the next book. Going Indian has appeal. Allying with the oppressed has appeal to progressive thinkers. I assume that the next book will start out there, in the Faloii village. 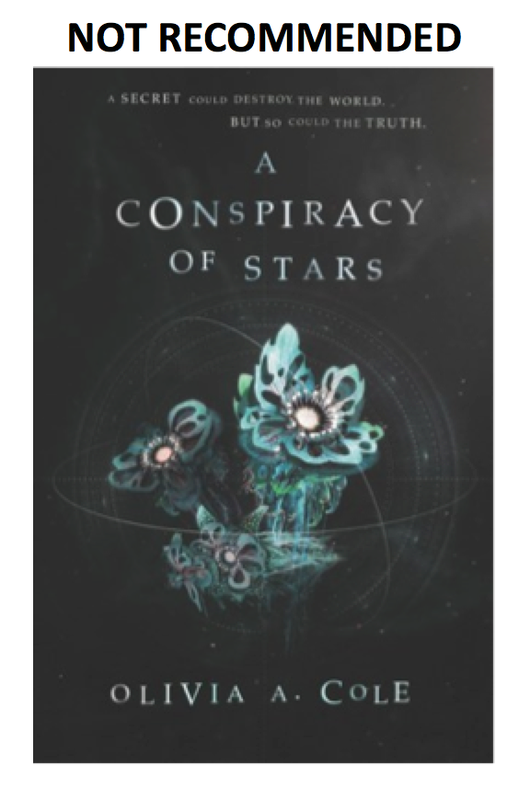 A Conspiracy of Stars is an old story dressed up (admittedly, there are some parts that are well-written) as a sci-fi fantasy set on another planet but it depends on a lot of the stereotypes that we're all too familiar with. That is why it is getting a not-recommended here, on AICL. Back with a note: Octavia isn't White. Even odds on whether it turns out that the grandparents are the leaders of a resistance group or something. "Allying with the oppressed" is not, I think, what a lot of Progressive thinkers are attracted to. It's more like "Leading the oppressed to victory" or, less often, "My advice is what brings victory to the oppressed." Note: I will use capital-p Progressive here, because they are not the same as people with progressive attitudes. I'm predicting this series ends up majorly on the White savior trope side of things. Which is bad. Like, there's literally no way to do the "White savior" trope right, because the trope begins and ends with "the White protagonist is the catalyst for the turning point towards a positive, rather than negative, outcome for the oppressed." The only way to do it "right" is to completely subvert it: the White "protag" actually deep-sixes the oppressed community, and someone of that community has to stop them and rescue the resistance; and the White protag then stops, and then passively observes end up being the ones who learn--not the oppressed community. Progressive thinkers totally do not want to write that. Or read that. Or publicize that. Or encourage that. Actually being an ally involves boosting someone else's voice over yours. That's very unattractive to Progressive thinkers, either consciously or unconsciously. I kind of don't want to think about the Progressives who see oppressed communities as a "culturally purer" place for them to live, or as places for them to draw support that they don't receive in their own communities. They unfortunately exist and very often impose; and if rejected, they very often turn on us because we weren't somehow nice enough to welcome them barging in? This tends to be where you get the "I used to support X community, but now I see how truly unworthy of support X are, and now I speak for the cause against allowing X community these specific rights" folks from. Hm. My cynicism is such that I think it's a bit less than even odds that this gets used as a way to add fake nuance to the series story. "OMG not all Faloii are good! Maybe we shouldn't help them after all, and that's somehow treated as a totally legitimate argument we will have in the second or third book to hang the fate of an entire people's potential slow genocide over." Oh well. Time will tell. I didn't note in the review that Octavia isn't White. I think we're meant to read her as Black. The author, Olivia A. Cole, doesn't specify her own identity. Her website says she's from Louisville, Kentucky. The photo on her bio page shows a white-looking person in a Black Lives Matter shirt. Ah, good to know. I'm still concerned the trope will show up; I've seen writers of non-Indigenous Asian heritages write similar tropes or even actual White protag White savior. But if the trope shows up, it'll additionally intersect with how Octavia's identity is handled. That might not end well. As James Joyce wrote, it is a shame that "[W]e hear also through successive ages that shebby choruysh of unkalified muzzlenimiissilehims [i.e. whites playing Indians] that would blackguardise the whitestone ever hurtleturtled out of heaven", especially when "[i]t [white people's fall from grace] may half been a missfired brick, as some say, or it mought have been due to a collupsus of his back promises, as others [the oppressed] looked at it. (There extand by now one thousand and one stories, all told, of the same)." As Lord Snow over at ImpishIdea points out, and I quote: "Where have I heard this before? Oh, yes, Star Wars. This is the story of Darth Vader. How could I forget?" White Savior = Darth Vader. Don't do it.